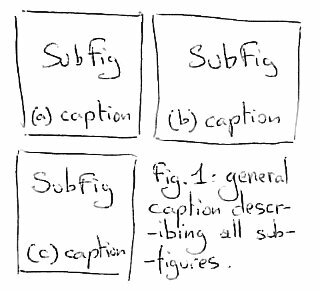 I know how to use the subfig package to fit many subfigures (each with its own caption) into a larger figure (with a general caption). I know how to use the sidecap package, the put a figure's caption on the side of the figure. What I do not know is how to display a caption inside the figure, as if it were a subfigure. More precisely, I have three subfigures that I would like to fit on a 2x2 layout, with the remaining quadrant used for the caption. Is that easy to achieve? The \fakeimage command is just for producing a blank box; you should clearly see how the dimensions are used for the "caption box". in the minipage environment would be sufficient. Not the answer you're looking for? Browse other questions tagged captions subfloats or ask your own question.